No matter where in the world you are, one thing will always remain constant: bugs. Whether it’s outside on the porch trying to enjoy a nice glass of lemonade or inside your house trying to watch the big game, bugs will always find a way to ruin everything. Many of the solutions to removing bugs from your immediate vicinity are not necessarily ideal solutions. Bug spray leaves a pungent smell in the air and can irritate your nose and throat. The various traps and other repellents available on the market aren’t suitable if you have pets or small children. When you’re ready to get serious about removing bugs, there is only one product that will work for you: the best bug zapper. 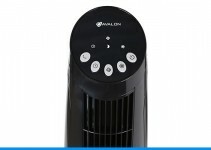 Buy the appropriate bug zapper for your environment. For example, an indoor bug zapper isn’t strong enough for outdoor use. 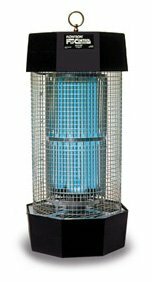 If you don’t want to see and hear bugs getting zapped, consider a bug zapper with an insect trap. Only dealing with a few pesky bugs? An electric swatter is a handheld zapper that could fit your needs better than a stationary zapper. Choose a solar-powered zapper if you don’t want to deal with stringing extension cables throughout your property. If your location isn’t suitable for a solar zapper, battery-powered alternatives exist as well. Presentation is everything! Many bug zappers also double as lawn ornaments, ensuring that your zapper isn’t an eyesore to your neighbours. 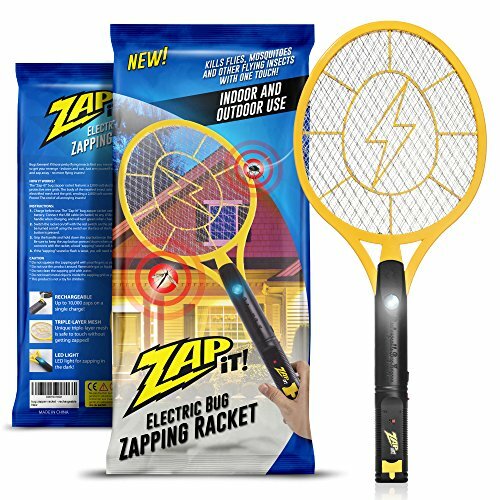 Handheld racket bug zappers use electricity to ‘swat, stun or kill’ bugs. These are battery powered and are usually charged through the push of a button. LED Lamp Bug Zappers tend to be choice for indoor use, as these are less visually invasive, use no chemicals and use less power compared to larger lanterns. Commercial or industrial settings tend to use larger lantern type bug zappers as these are more effective over all. Particularly in food serving environments. Outdoor bug zappers tend to come in the form of larger lanterns and lamps. Bigger than their indoor equivalents, more power hungry. These often use chemicals, as well as certain ranges of light frequency (UV particularly) to attrack bugs within zapping range. The outdoor bug zapper is usually waterproof and able to handle the larger quantity of demand in an outdoor environment. Now that you know what to look for, you’re ready to go on the offensive in your war against bugs. To help you prepare for combat, we’ve selected 10 of the best bug zappers that money can buy. No matter what kind of zapper you’re looking for, you’ll find it on the list below. When you only want to zap just a few bugs in your immediate vicinity, then you’ll want the Zap-It! Bug Zapper. This zapper uses a powerful 2,000-volt grid to vaporize any small flying insect that comes into contact with it. Mosquitoes, flies and gnats don’t stand a chance against this bug zapper. The Zap-It! Bug Zapper uses a rechargeable battery that charges when it’s plugged into any USB port. The built-in LED light lets you locate and zap bugs even in the darkest environments. However, you don’t need to worry about vaporizing other humans or animals, as a strong mesh guard protects you from accidental exposure. It can get hot working in a kitchen, especially when you’ve got multiple burners and an oven going all at the same time. However, as soon as you open a door or window to let some of the heat out, you’re also letting a horde of bugs in. The Aspectek Powerful 20W Electronic Indoor Insect Killer is your first and last line of defense against flying bugs like flies and mosquitos. 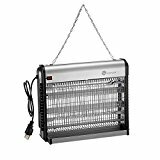 This indoor bug zapper instantly attracts and kills any flying insect that comes into contact with it. The best part about the Aspectek Powerful 20W Electronic Indoor Insect Killer is that it uses no chemicals, making it an excellent bug zapper for a sterile environment. When you’re looking to remove the pests from a farm or any other large area, the Flowtron BK-15D Electronic Insect Killer is an ideal choice. 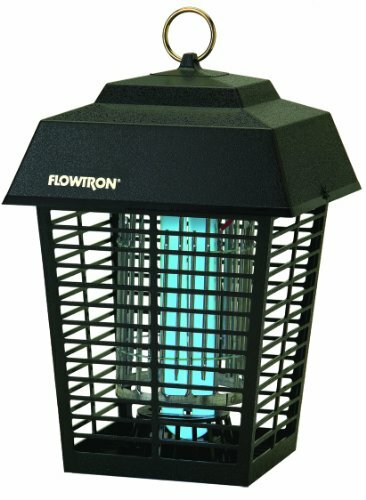 The Flowtron BK-15D Electronic Insect Killer covers a distance of up to half an acre. The non-clogging core will ensure that bug remains don’t accidentally cause the device to catch on fire. A protective grid surrounds the electric zapper to make sure that birds, cats or even children don’t come into contact with it. For best use, the manufacturer recommends that you don’t use the Flowtron BK-15D Electronic Insect Killer within 25 feet of a highly-trafficked social area. If you’re finding yourself on the porch just as often as in your living room, then you’ll want the Electronic Indoor & Outdoor Insect Killer. In addition to zapping all flying insects, this bug zapper also takes care of any pesky spiders in your vicinity. The 20-watt UV light in this bug zapper is a beacon to insects, luring them to their death. Unlike other bug zappers, the Electronic Indoor & Outdoor Insect Killer has a stylish design that seamlessly blends into any environment. 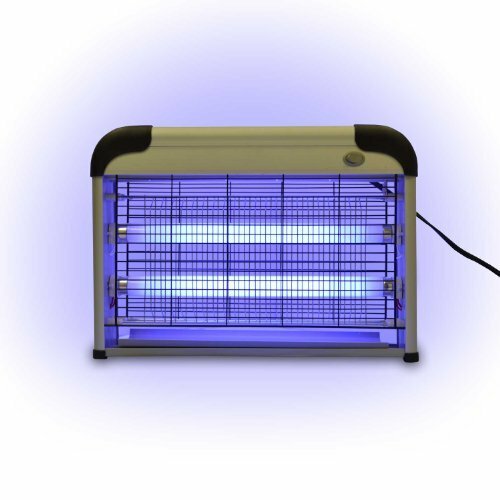 This bug zapper is safe for both children and pets as it uses no chemicals and outputs no fumes. If there one thing everyone can agree on, it’s that wasps are one of nature’s most terrible creations. 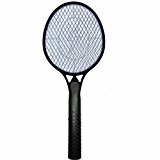 Fight back against the evil wasp empire with the KORAMZI F-4 Best Electric Mosquito Swatter Racket. This inexpensive handheld bug zapper will make short work of any wasp that comes into contact with it. Mosquitoes, flies and gnats all better watch out too; if it has wings, this bug zapper will annihilate it. You don’t need to worry about getting a nasty shock yourself as the electric zapper has a protective mesh that prevents anything larger than a bug from touching it. The TaoTronics Insect Killer is probably the most versatile bug zapper on this list. Thanks to the included chain and stand, you can place this bug zapper anywhere. For example, you can put it in the corner of a room or hang it up from the ceiling. 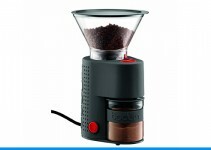 The collection tray easily slides out from the zapper, ensuring that cleaning up takes only a few minutes. The included brush lets you give the TaoTronics Insect Killer a deep clean to ensure that no leftover bugs are clogging up the device. 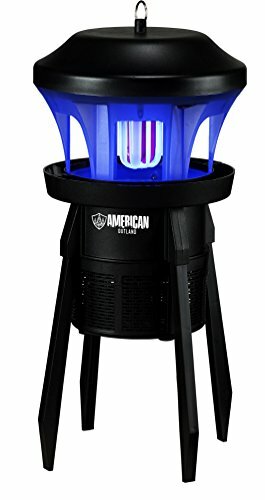 The Stinger 3-in-1 Kill System Insect Zapper is an outdoor bug zapper designed to cover over half an acre of space. The Stinger 3-in-1 Kill System Insect Zapper uses cutting-edge technology to eliminate more bugs than the competition. Instead of a bright white light, this zapper utilizes a UV blacklight that kills 40 percent more bugs. This number wasn’t just pulled out of thin air, as the Stinger 3-in-1 Kill System Insect Zapper underwent numerous scientific tests to determine this number. If you’re worried about this bug zapper driving up your electric bill, you’ll love the fact that it includes energy-smart sensors. These sensors will automatically turn the zapper on during times of peak bug concentration and shut down the zapper when no bugs are present. 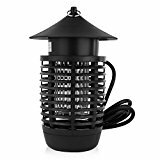 The SereneLife Indoor/Outdoor Bug Zapper resembles a lantern, which goes a long way towards disguising its true nature as a bug zapper. This bug zapper is perfect for homeowners with pesky neighbors who are apt to complain about any decorations they perceive as an eyesore. The SereneLife Indoor/Outdoor Bug Zapper is about more than good looks, as it uses an integrated UV light to kill bugs with no chemicals. The weather-resistant case means that even after the roughest of storms, your bug zapper will look just as good as the day you bought it. The SereneLife Indoor/Outdoor Bug Zapper requires no batteries: Just plug it in, and the bugs won’t know what hit them. The American Outland BZ5002 Indoor/Outdoor Silent Eco-Friendly Bug Killer is one of the more expensive bug zappers on this list, but only because it packs in more features than any other zapper. Not only can this zapper work both indoors and outdoors, but it does so silently; in fact, you’ll only know it’s running because there aren’t any bugs in your vicinity. This zapper is one of the safest for indoor use, as it doesn’t use either chemicals or an electric shock. While other zappers are prone to catching on fire, the American Outland BZ5002 Indoor/Outdoor Silent Eco-Friendly Bug Killer use a fire-resistant material designed to keep your family safe.